No "Image Backup" is displayed on the "Start" screen. Image backups fail, no drives are displayed in the disk selection window. Locate the setup file you used to install the current version of NovaBACKUP on your machine or via Windows "Programs and Features"
NOTE: If your anti-virus or anti-malware real-time protection software blocks .reg files from being saved then you may need to temporarily disable that type of software while you download and run this registry fix. You can re-enable the software after the fix is performed. 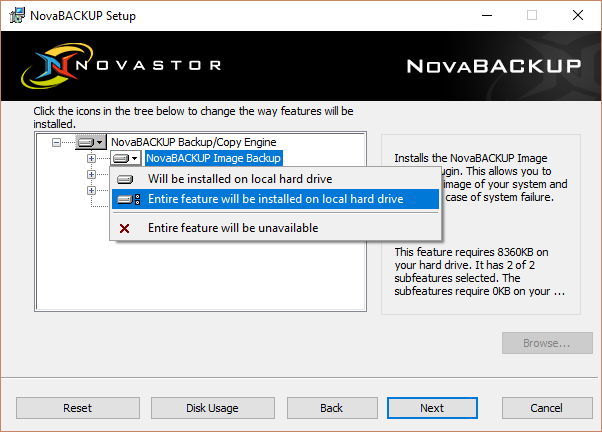 When it starts select "Maintenance", "Next", followed by "Change"
Select the drop-down to the left of "NovaBACKUP Image Backup"
Choose the option "Entire feature will be installed on local hard drive"
Select "Next" until you "Finish", if prompted to reboot, choose "Yes"
NOTE: You must reboot the machine to allow changes to the registry\drivers to be applied. If the section does not exist in the "nsconfig.ini" add it completely and copy it to the end of the file as the last section.